Earn 397 loyalty points when you order this item. Yamaha CD-S700 CD player is perfectly designed to for the A-S500 and A-S700 integrated amplifiers, both acoustically and aesthetically. The sound quality is of paramount importance, the CD-S700 maximises the enjoyment of CD music and USB audio. Featuring the exclusive Yamaha Loading Mechanism which is incredibly smooth and super quiet which is combined within this high precision CD Drive. Plus, a differential Digital-to-Analogue converter that is capable of converting with high precision and low noise. 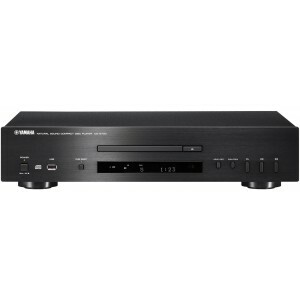 The CD player also has an independently structured power supply and uses the Pure Direct technology. This unit becomes a CD MP3 player by utilising the front panel USB port, which allows you to play files stored on a USB memory stick. Also, the CD player is capable of decoding MP3 and WMA files stored on a CD. You can clearly see Yamaha's musical instrument manufacturing heritage in this CD player, the build quality is immaculate. Plus, with gold-plated output terminals and an aluminium front panel contributing to a very well made CD player and a premium product.